For the fourth consecutive year, Pure IP is excited to be attending "Evolve: A UC Day Event" in Birmingham, England. The Microsoft technology-focused event is tailored towards IT professionals of all experience levels who are interested in learning more about the latest Microsoft products and integration options. At “Evolve: A UC Day Event," Microsoft experts will discuss best practices, new features, and overall trends in the UC industry. Pure IP will be joining fellow industry professionals and experts at the event as a Gold sponsor; we will discuss our latest Microsoft solutions such as Skype for Business Cloud Connector Edition (CCE) and direct routing for Microsoft Teams. Our voice communications expertise is paired with a focus on customers service and an extensive coverage map, providing number coverage from over 80 countries with full PSTN replacement in 32 countries. Additionally, Pure IP’s solutions are built on the latest technology giving greater flexibility for design and agile implementation. 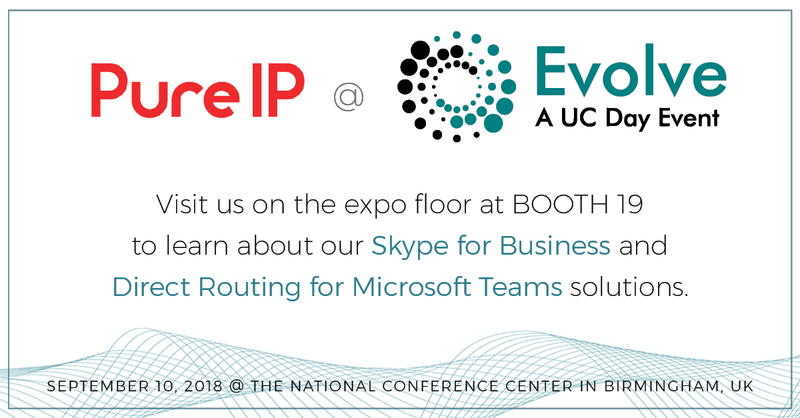 Come visit members of the Pure IP team, including CEO Gary Forrest, on September 10th at booth 19 at the "Evolve: A UC Day Event" in Birmingham, England, to learn more about our Microsoft Skype for Business CCE, on-premise, cloud solutions, as well as our Direct Routing for Microsoft Teams, SIP trunking, and SD-WAN One solutions.